Remember back when crowdfunded games would take risks and give gamers something different than the standard offerings? Those were the days, right? Now with platforms like Fig and Indiegogo offering crowdfunding as an investment option, safer, more marketable games are making a comeback. It’s a bit disappointing. Kingdoms and Castles was met with resounding support when they launched their Fig campaign this month. At the time of this article they have already managed to raise 398% of their $15,000 funding goal and still have almost a month left of their campaign. For $59,748 this game should be quite impressive, but it’s kinda not. Don’t get me wrong, developers, Lion Shield appear to have made a fully competent medieval, city-building, fantasy sim. 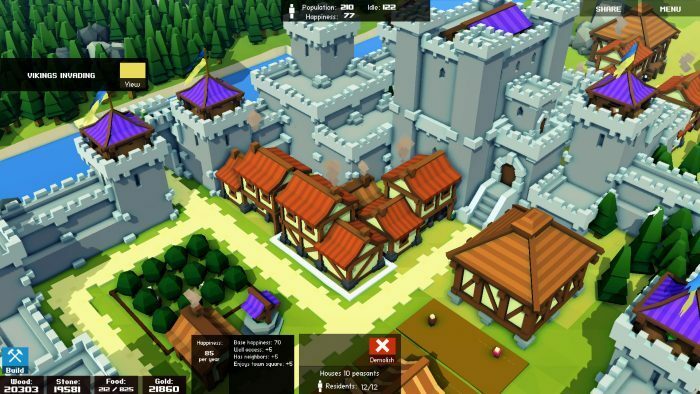 Drawing inspiration from SimCity, Banished, and Stronghold, Kingdoms and Castles is all about growing a tiny hamlet into a sprawling kingdom. 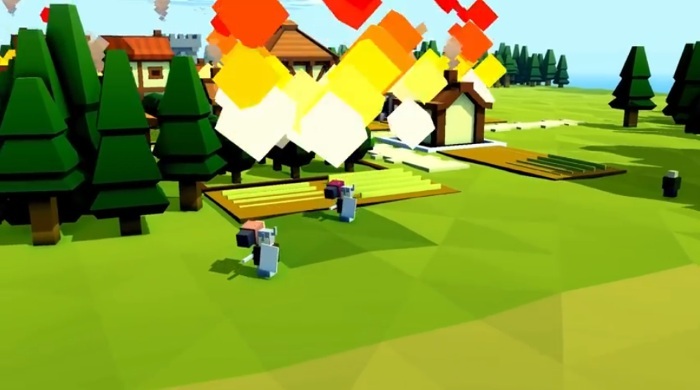 Players have to manage resources and villagers to help their castle thrive and ward off pesky viking attacks. It will be a fun little time-sink and plenty of people will step up to buy it. 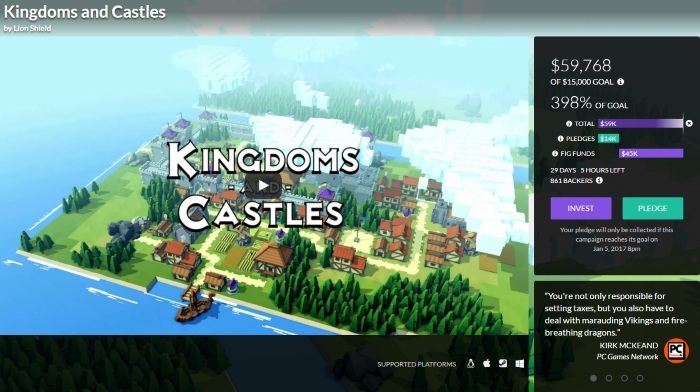 As if the developers needed more proof, Kingdoms and Castles sailed right through Steam Greenlight. So what’s my problem? Initially, when I saw how ridiculously popular the campaign had become in just a short while, I assumed I was missing something. It’s not uncommon for me to initially overlook pure crowdfunding genius the first time I see it. What can I say, I look at a lot of campaigns. So, when I finally got around to checking this one out, I was a bit underwhelmed by what I saw, but mostly confused. How was such a standard city-builder with pretty basic graphics so enthusiastically crushing its funding goal? Turns out there’s a simple reason, investors. A quick perusal of the Fig page reveals a pretty comprehensive breakdown of the funds gathered thus far. It turns out only $14,000 of the total goal has been raised through actual pledges. Certainly nothing to scoff at, but still below the $15,000 the campaign is seeking. All the rest of the funds, $45,000 worth, comes from investment proceeds paid out by Fig Funds. We’ve questioned the investor model of crowdfunding before. Noting how it seems to undermine the spirit of letting fans fund the games they want to play. It’s still too early to denounce this model, but something just feels off about games that look like safe, solid business investments rather than the alternative indie darlings we’ve come to love. Again, Kingdoms and Castles looks fine, if a bit uninspired. There are already plenty of city-building games though, many with better graphics and mechanics supporting them. It just seems weird to consider this one as a crowdfunded game when it was mostly funded by investors looking for a safe bet to make a buck.